In a tragic turn of event this morning in Flushing, New York 2 buses crashed leaving destruction and injured victims scattered in the streets of Queens, NY. Innocent bystanders just walking casually down the street become victims to this deadly crash. 3 dead 16 injured according to eyewitness reports after a tour bus “speeding” down a busy Queens street crashes into an MTA bus this Monday, September 18, 2017. The Dahlia Travel and Tours charter bus slammed into the Q20 MTA bus around 6:15 a.m. at Northern Blvd. and Main St., in Flushing, New York sending both buses careening onto the sidewalk and killing a pedestrian, NYPD said. Witnesses describe the tour bus as flying down the congested street of Flushing when the collision happened. The accident scene was chaotic with injured victims crying and screaming. People were pinned under the front of the city bus. One man’s head was split open, with many other people hurt. Reports indicate that one victim died on the scene, one at Elmhurt Hospital, and a third victim at New York-Presbyterian Hospital Queens. Six of the passengers stated in critical condition, one individual in serious but stable condition and nine others suffering minor injuries. Onlookers watched as a bloodied man was removed on a stretcher wearing a neck-brace. There was shattered glass all over the block. One driver lay traumatized up against a pole. Another man lay on his side while being treated by an NY firefighter. The driver in one of the buses was pinned and needed to be excavated. Authorities are investigating a report that the charter bus ran a red light. The impact sent the city bus spinning onto the sidewalk. NYPD’s 109th Precinct, in a post on Twitter, wrote that the collision was “very serious” and caused heavy traffic delays. Flushing bus crash | Three killed, 16 injured after tour bus slams into MTA bus in Queens. FDNY rushed to extinguish small fires, shut off leaking gas in a nearby buildings struck by the out-of-control buses, officials said. On Monday afternoon, police identified the victims as Raymond Mong, 49, of College Point Boulevard in College Point, who operated the tour bus; Gregory Liljefors, 55, of 140th Street in Flushing, a passenger on board the Q20 bus; and Henry Wdowiak, 68, of 35th Avenue in Flushing, a pedestrian who was walking at the intersection when the crash occurred. In February 2016, a Dahlia Travel and Tours bus bound for Mohegan Sun Casino in Connecticut rolled over during a snowstorm. 36 people were taken to the hospital. The tour company is based in Flushing. According to the state police, the bus struck a guardrail and flipped onto its side shortly before 12:30 p.m. near the Exit 61 off ramp of I-95 north. In all, 36 people were taken to hospitals and medical clinics, police said. Of the 16 people taken to Yale-New Haven Hospital, four were described as being in critical condition, hospital spokesman Mark D’Antonio said Tuesday. Three of six additional patients who were transferred to Yale-New Haven from Middlesex Hospital in Middletown also were listed in critical condition, he said. What a way to start a Monday with a casino bus crash that injures 12 in Rego,Park, Queens. A Resorts World Casino New York City bus crashed into a building while trying to avoid a vehicle making a sharp turn in Queens Monday afternoon, critically injuring the bus driver and hurting several other people, according to NYPD. The casino bus driver was traveling north on Woodhaven Boulevard in Rego Park, NY,when another vehicle made a sharp turn in front of him at 63rd Avenue. The bus driver in an attempt to avoid hitting the vehicle, made a sharp right turn and struck the corner of the building at 62-87 Woodhaven Blvd., smashing through the building. According to breaking news reports a bus rear-ended another bus inside Lincoln Tunnel. There are reports of up to 35-40 people have been injured. The Port Authority of New York and New Jersey says the buses collided around 9:35 am eastern time. Dozen people injured when two buses collided in the Lincoln Tunnel Wednesday. It has been reported that an inbound New Jersey Transit and private bus collided around 9:35 a.m. in the center tube close to the Manhattan side of the tunnel. Traffic is at a complete halt. The center tube of the tunnel is closed. Expected 1 hour delay. The Holland Tunnel has been affected with traffic delays. Traffic in the George Washington Bridge seems to be flowing. Sep 2, 2014 Heavy traffic at the Lincoln Tunnel in Weehawken after a bus accident in the center tube, in which seven people were injured. Nov 12, 2012 – More than a dozen people were injured — two seriously — when two buses collided during rush hour this morning outside the Lincoln Tunnel. A B62 bus driver struck a cyclist and pedestrian in South Williamsburg Tuesday night, Sept. 16th around 8:15 p.m. Lucky there were no fatalities; both victims were transported to Bellevue hospital in stable condition. However, immediately after the bus crash, at Wythe Avenue near Division Street, a cyclist lay on the street blood-stained in front of the stopped bus that hit him. Pedestrian deaths in New York City are still riding according to an analysis of NYPD reports, if things keep pace there could be over 200 such deaths by the end of the year. NYPD data shows there were 156 fatalities in 2013, an increase from 152 in 2012 and 142 in 2011. Is Vision Zero in New York Working? What can be done to prevent such avoidable pedestrian accidents? Give us your thoughts New York. Suggestions include: holding drivers accountable with tougher punishments, create safe roads with lights and speed bumps and continuously building driver awareness. According to the National Highway Traffic Safety Administration, an estimated 59,000 pedestrians were injured and 4,092 pedestrians were killed in road traffic accidents. Both bicyclists and pedestrians have no protection from distracted or speeding drivers. The elderly, and children, as seen with the latest pedestrian hits in New York are at risk where they receive traumatic injuries and sadly death. In the event that a pedestrian or a bicyclist is injured by a vehicle hiring a traffic accident attorney will ensure that they receive the proper compensation to cover the medical treatment for their injuries. If you or someone you love has been injured due to the negligence of a motorist, contact a NYC personal injury attorney to discuss your case. Consultations are FREE. According to Mean Streets Of New York The Pedestrian Death Toll Is 84. 4:00 AM Van Wyck Expressway near JFK Airport. The victim was struck and killed while changing a tire on the side of the Van Wyck Expressway. He was hit from behind by a livery van, according to news reports. 8:26 PM Rockaway Boulevard at Brookville Boulevard. The victim was loading a motorcycle onto a pickup truck on the side of Rockaway Boulevard, after the motorcycle had broken down, according to police. A Chevy van struck the back of the pickup truck and the people loading in the motorcycle. The victim was pronounced dead at the scene. 6:01 AM Hutchinson River Parkway at Exit 3E. The victim was struck after she ran onto the northbound lane of the Hutchinson River Parkway, from a car parked on the service road. She was pronounced dead at the scene. 10:01 PM Astoria Boulevard and 80 Street. Melania Ward was crossing Astoria Boulevard in the crosswalk when she was struck by a Q47 bus turning right from 80 Street. Ward was taken to Elmhurst Hospital, where she was pronounced dead. 10:27 AM Bedford Avenue and Gates Avenue. The victim, an unidentified man, was crossing Gates Avenue when he was struck by a sedan turning left onto Gates from Bedford Avenue. The victim was pronounced dead at the scene of the crash. 4:53 AM Liberty Avenue and Tuckerton Street. The victim, an unidentified man, was crossing Liberty Avenue when he was struck by a vehicle headed west. The victim was taken to Jamaica Hospital, where he was pronounced dead. 2:03 PM East 79th Street and Madison Avenue. The victim, an unidentified woman, was crossing 79th street when she was struck by a taxi turning left from Madison Avenue onto 79th. The woman was pinned under the taxi, and bystanders flipped the vehicle off the victim, according to news reports. She was taken to Lenox Hill Hospital, where she was pronounced dead. 8:22 PM 509 Avenue P. The victim, an unidentified man, was crossing Avenue P when he was struck by an SUV headed east. The victim was taken to Coney Island Hospital, where he was pronounced dead. 14 people were injured when two double-decker buses collided in Times Square in Midtwon, Tuesday afternoon, causing a traffic light pole to topple over and smash onto the ground, according to NYPD and NYFD. The buses crashed at 7th Avenue and West 47th Street, near the famously red-staircased TKTS booth in the middle of one of the most heavily trafficked areas of New York City. It’s not clear what caused the collision, and the NYPD said investigators were still on the scene investigating. 14 injured so far. 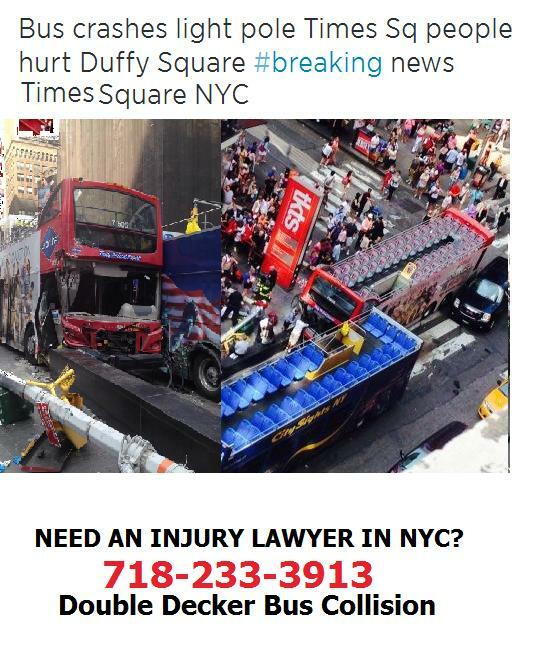 Double Decker buses collide in New York Times Square.